Do you find yourself having chronic pains in your abdomen area, like areas of stomach or the left/right abdomen area? 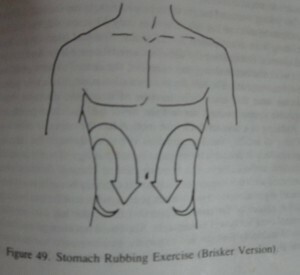 There is a simple stomach rubbing exercise adopted for thousands of years that is so simple and yet effective. It is taught in the book The Chinese System of Self Healing by Dr Stephen Chang. 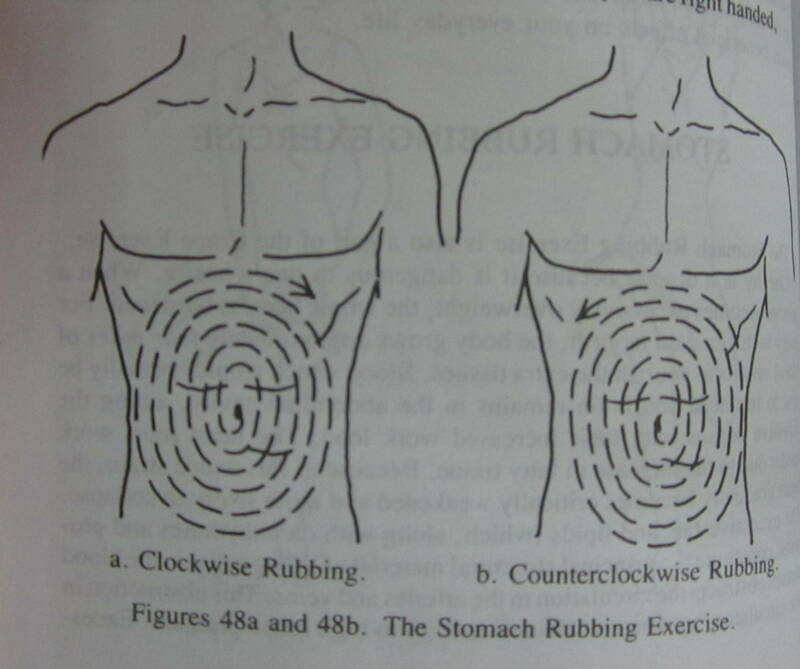 The exercise basically consist of rubbing the stomach first clockwise and outwards, then anti clockwise and inwards. 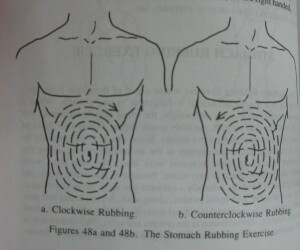 Then another quick rub- using both hands- from the side rising upwards and then moving downwards at the middle area. The author also advised to use the power of visualisation- visualise energy coming from your hands as you are rubbing and penetrating into the skin and organs underneath. You should feel the energy being retained and is heating up your abdomen tissues. I find the exercise to be quite effective. For few weeks as well as on and off I was having some discomfort on the left side of my abdomen. Even by trying to take more fruits and vegetables also the chronic pain sometimes appear. After trying to stomach rubbing exercise for just a few days, the pain was gone. And it mentioned that this exercise can help to slim down the stomach by breaking down the fat cells located in the abdomen area. Note: If your discomfort persists, then you need to consult with the doctor. But if the doctor mark down to food intake or stress and prescribe to you anti acids or charcoal tablets and painkillers, then you are better off just doing these exercises. To check on the exercise, visit http://www.thegreattao.com/html/taoofrevitalization.html and scroll down to Stomach Rubbing Exercise. 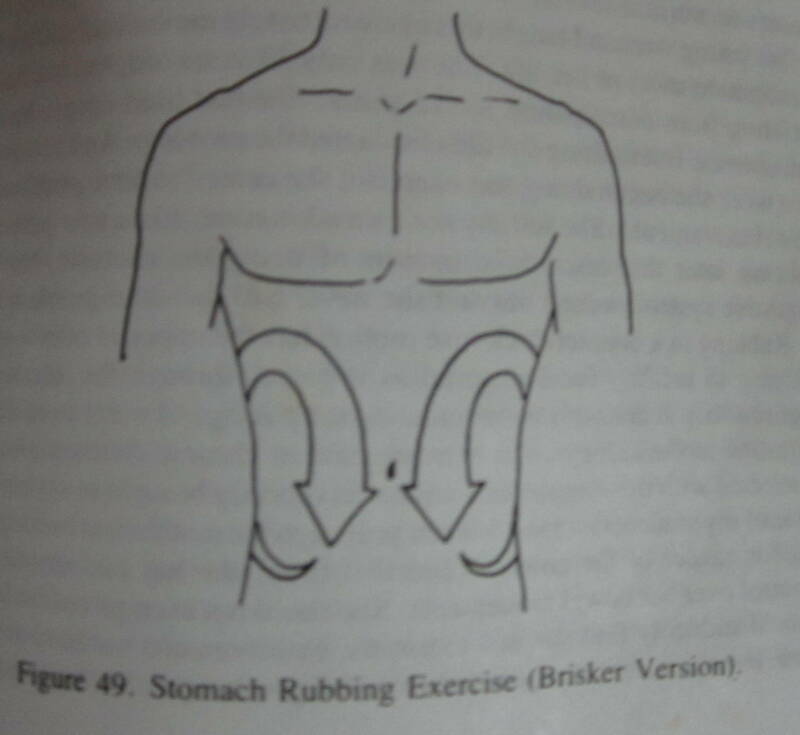 From there, you would see a diagram and instructions on how to perform the exercise (I actually read the book and was glad to know that there is an online version of the book available in the website). 1. A young woman aged 23 years old who have suffered from constipation for 15 years could not find relief through drugs, laxatives and enemas. Within the first week of trying the simple exercise, her bowel movements were restored to normal. 2. A lady who had been operated due colon cancer had no control of her bowel movements and suffered from an extreme case of chronic diarrhea. She could not go out of the house for fear of not having access instantly to a bathroom. After doing the exercise for a few days, for the first time in 10 years, her stools could form. She could now lead a normal life. 3. A 96 year old man still active in his job and duties used to be a sickly child when young. Once, he travelled through difficult road to seek out a wise man only to be told to ‘rub his stomach’. Despite, because he had so much of stomach ailments, his painful stomach ulcers and even his tuberculosis gradually went off. He rubs his stomach daily and whenever he feels uncomfortable- and he has the health and vigor of a man 1/4 of his age. 4. A man, suffering from terminal liver cancer had a distended abdomen filled with water. He was in a lot of pain and given a few weeks to live. Every week he had to get water pumped out from his abdomen. Desperate to try anything, he tried the stomach rubbing exercise taught by the author, when he went back a week later, his doctors said his recovery was a miracle. Even though his liver still had cancer cells, it had cease to bother him.